Stepping stone path site covers a few basics of planning and design. Here are some things to consider before you start anything in your yard. Designing and planning for a stepping stone path. There really isn't a lot involved in designing a rock pathway, but with any project there is always planning to consider that the average do-it-yourselfer may not know. Make sure the lines of your garden paths have a nice flow. Informal designs are more often flowing curves and may look better while working with natural stones, while straighter lines (formal designs), are more suited for working with manufactured products. 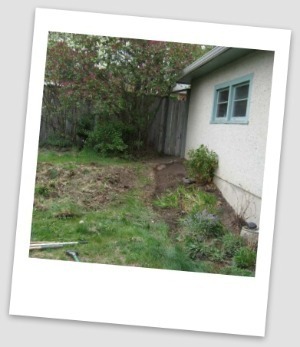 Here is a before shot of a stepping stone path project we will be building for this article. This particular section will be built in a bed of decorative rock. 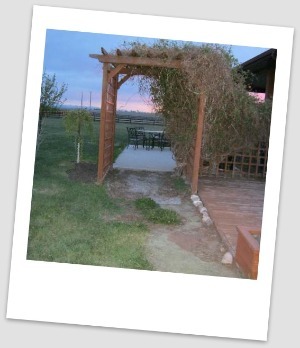 The client chose this method to avoid mowing around the arbor and patio. Avoiding awkward areas to maintain is considered practical planning. This can be a great time to add some simple garden features to your yard. They will compliment the walkway, soften it up and give the curve some purpose. If you are planting along your pathway try to repeat patterns, colors, and shapes to give a nice rhythm. This rhythm will give your design a unity and flow that will make it look right. With a stepping stone path, you will be controlling the flow of movement in your yard. Make sure you space the stones so they are practical for an average stride or people will not use the path. Plan everything you do to be done in a logical sequence. Proper planning with any landscaping project always saves time and money. For example, low voltage lighting will require buried lines to be installed. This should be one of the first things you do once you have your site mapped out. This picture to the right is another project we will follow for this article. This stepping stone path will be set directly into the lawn leading from a patio to the back gate. finding cheap landscaping ideas like a stepping stone path is a great way to increase the value of your property. A stepping stone path is easy to install, but you still have a few choices to make. For example, there are different materials you can use between the stones. Some people prefer to set them in the grass, while others may choose a bed of decorative rock, mulch, or just plain gravel. Which will you choose that is the most practical for your yard? If you are using your path in the winter, remember that the surface can get slippery. Try not to use salt on the surface, as it can damage the stone. Be aware of any trees that have yet to develop large thick root systems that can push up the stones. When you are playing with different designs for your path, you can use an inverted marking paint (available at most hardware stores) to paint out your ideas. You can also use a garden hose or rope. Plan to accommodate any future development should also be considered when landscaping walkways. You may want to have extensions or other features added to your yard down the road. Be aware of any man made objects that may impact you design. We always take a number of pictures for each project no matter how big or small. Review the pictures looking at the big picture so you don't miss important details when planning. For example, how can a water from a downspout affect your feature? Although you will not be digging down very deep, you should still call before you dig. Underground gas lines, power lines, cable, water, phone, sewer, septic systems, and buried drain tile are just some of the things to think about. Make the phone call to have a locator mark these with flags and/or marking paint. 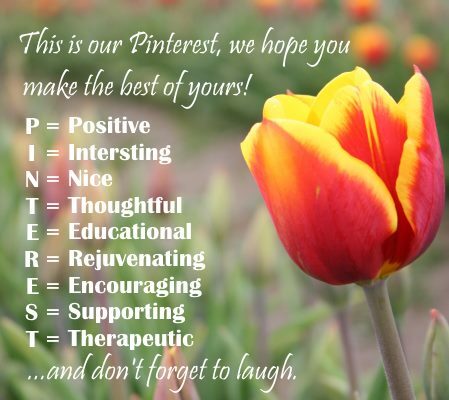 There is no charge for this service in most places. These things have actually forced me to alter a design if I couldn't work around them. If you have in-ground irrigation make sure you call your service company to map out where your lines are. They are not buried very deep and can easily be cut with shovel. They may also want to make changes to the system and zones to benefit you. If you are planting in and around your pathway, they may want to install some irrigation to feed water to your new features. 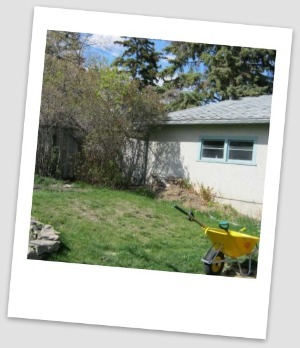 So with your stepping stone path site planned out, it's time to head to the shed and grab your tools.